So I haven’t been a part of teacher week yet, (due to the exhaustion of my first week back!) but I already had my classroom pictures done and wanted to link up for this one. 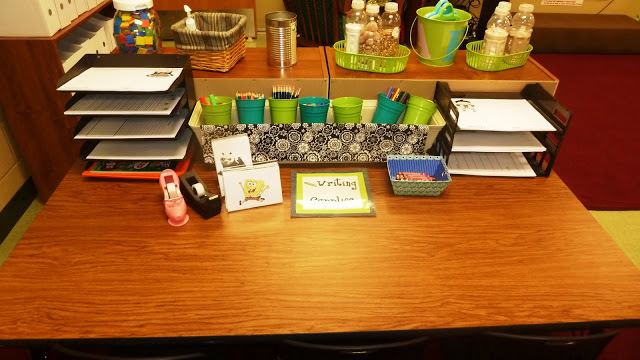 I LOVE spying into your classroom so here is a peek into mine! 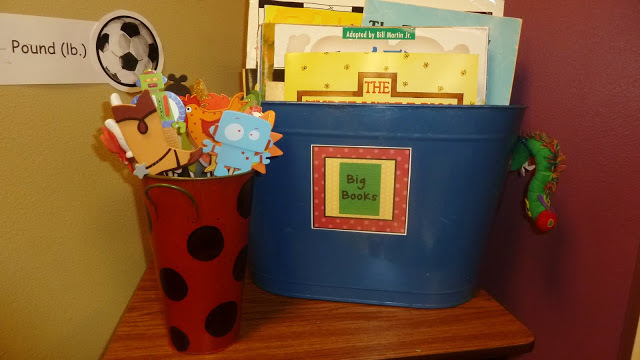 Link up at blog hoppin and join in for teacher week! 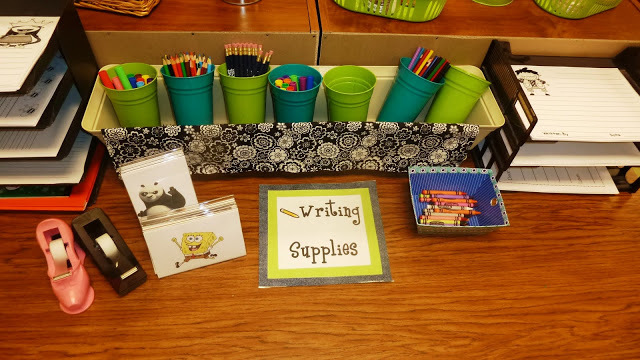 My classroom is staying the same mostly, but I have made improvements that I love and that I hope will make this year smooth sailing…I don’t have a theme but my overall desire is to have a cozy home feeling that is very organized. This is part of the front wall of the room. It is where the morning meeting takes place. It is also the new home for my word wall. This reference wall is still in progress. 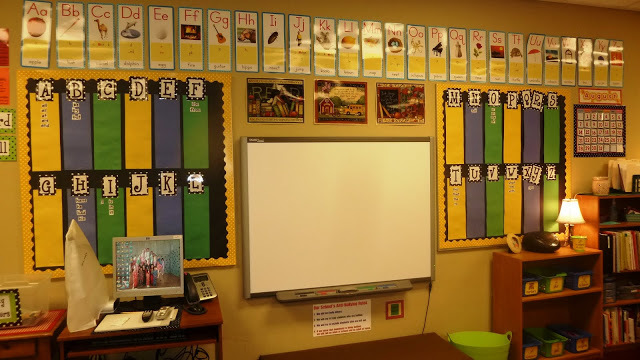 I am re-doing my reading strategies posters and some other little things that will be added to this wall. Pretty self-explanatory…big books and pointers. This is my writing station. I moved it to a larger area this year. I added the frame friends for editing. Below is a closer look. 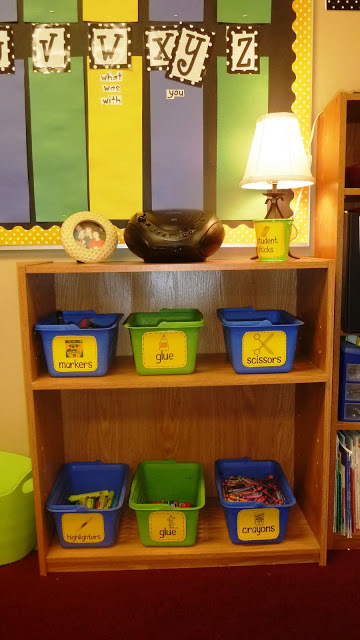 Here is my new and improved word work supply area. It makes me happy to look at it. I guess we could call this “the before students arrived” picture..I will have to train those kiddos how to make it look like this because we ALL know it doesn’t come naturally to them!!! 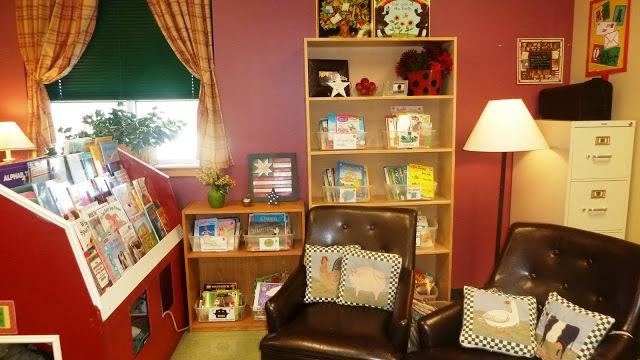 This is the back wall where I keep my classroom library and my reading spots. My son took over the book barn for the day with a giant blanket, his laptop, and a pillow. It looks messy in there but well worth the mess to keep that boy entertained while momma makes a pretty classroom! This is the right hand side of the back wall. Normally there is not a cord running out of the book barn window…again it’s my son’s computer cord. 🙂 The black blob on the top of my file cabinet is a mailbox. It goes with the writing station. 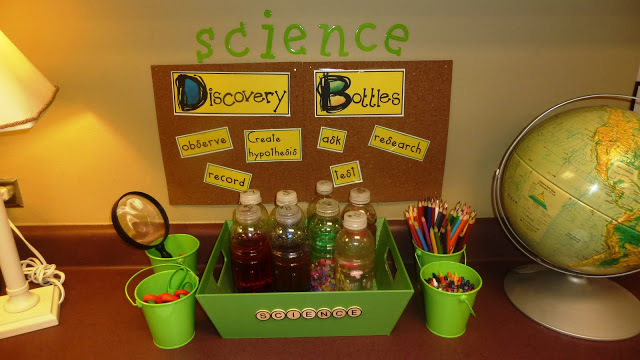 This is my science station and up first—the discovery bottles! There’s a part two of classroom pictures as well. Link up at blog hoppin! Wow! Your room looks awesome!! You must have been working hard all summer! I moved rooms and I have a big mess on my hands. I'm off to tackle it tomorrow. Very impressive! How did you build the barn??? I love it! Great looking room!! Thanks for sharing! Fan-tas-tic, Reagan! This room is sooo beautiful. Thank you for sharing and inspiring. I love it… especially your word wall! It makes me want to redo mine! Your room looks fabulous! 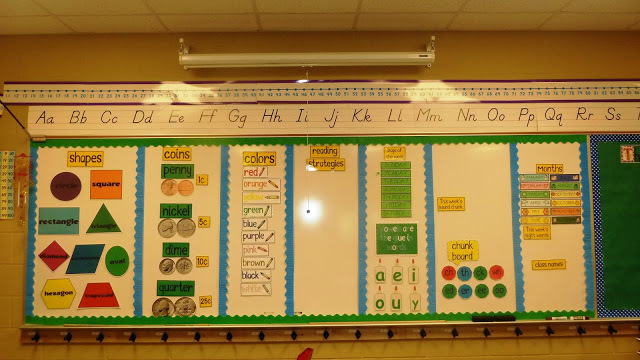 Where did you get your alphabet cards that are above your word wall? Love them! It looks great! You're room looks so cozy and homey! You mentioned your shelves were before the kiddos got to them…I take pictures of my shelves before the kids come then velco each shelve's picture to the side. The kids can take of the picture and make sure the shelf looks the same! Many of my students take clean up time ver seriously and compare to the picture! Your room looks awesome!! I love the green rocking chair! Thanks so much for sharing!! okay I am getting moved emotionally from these comments. I heart you guys. so. darn. much. I love what you have on your door and your word wall. I might have to borrow those ideas. Great job! I didn't think your room could get any better! Your mission was accomplished…comfy and organized. I like your new word wall. Have a great school year! I am in love with your decorating style! Would you mind if I copied it? I LOVE your word wall and think I might have enough room to do it around my Daily 5 / CAFE bulletin board. 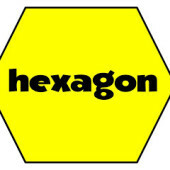 Can you give me some dimensions on how wide the colored pieces of paper are for each letter? I'd appreciate it. Amazing. My theme this year is home away from home, with cool colors, blues, greens, etc. Thank you for the great photos!!! Now my thoughts are easier to see!!! As always, you never cease to amaze me! Your room looks truly phenomenal. I love you and miss you terribly!! 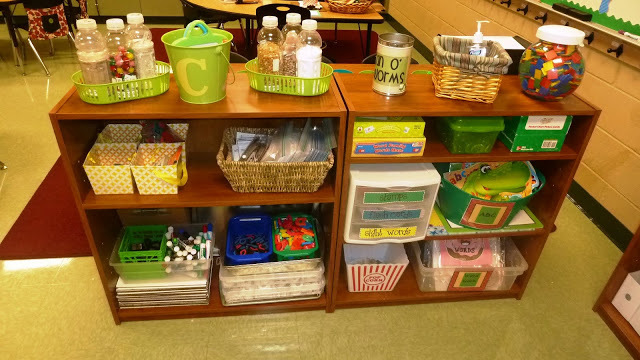 I love how organized and cozy your classroom is! Amazing! I can't wait to get into my classroom!! Were you able to paint your walls? Ours are hite cinder-block- Blah. Where did you get all of your shelving? I love everything about your room! Our walls were painted this way so we are very lucky! OMG! I just found your blog tonight from your linky party! First of all, your room is freakin adorble! So cozy and organized = me super jeal. My room is a pit right now!!! Second of all, how do you label your books in the barn? I know you said genre/topic but can you explain it a little more? Or have you already done that somwhere? Oh your room is a dream!! 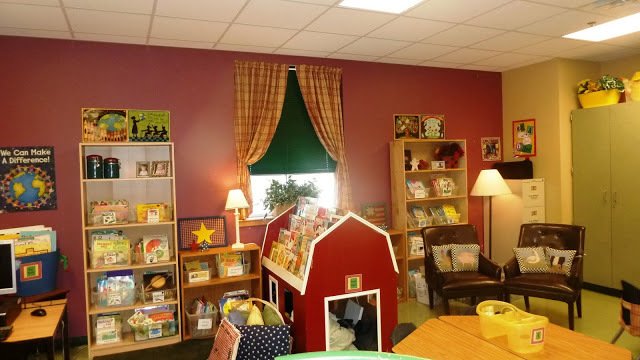 I LOVE the book barn, the reference wall, and the word wall at the front of the room. So cute!!! All of your ideas are inspiring me! Thank you for sharing. Where did you get those super cute pointers? Love them! Your discovery bottles are awesome. Thanks for sharing! The pointers are from hobby lobby. I bought prepainted cute wood items and just hot glued them to dowels. 🙂 easy! 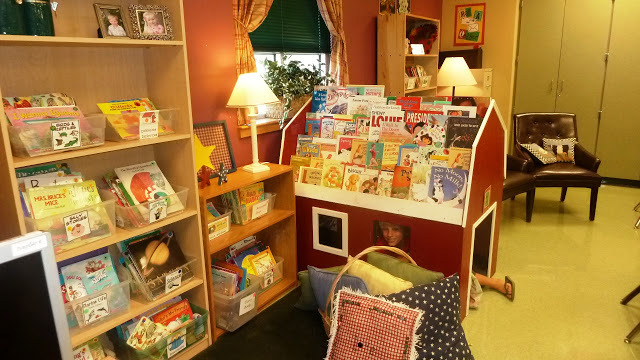 Absolutely beautiful…inspiring…cozy…Your kids will love it. What a great learning space. I am in love with the barn reading nook! Me too Angela I want one!!!!! I love your word wall set up!!!! And your room. It's awesome! For real. 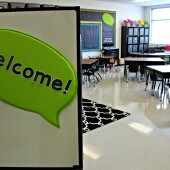 I love your blog design and your classroom design! Your room is a place I would want to learn. I am new to blogland, so I thank you for your inspiration! Love how you made your room so beautiful. It the real you that describes your room. So beautiful, neat and organized. I LOVE it! I love your bucket of pointers. Great idea. Thanks for linking up 😀 ! 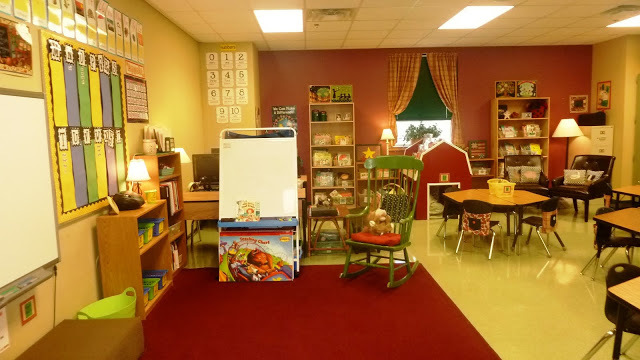 Holy Classroom envy…i LOVE LOVE LOVE your room. Oh. 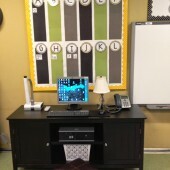 M. G.
Can you explain your word work area? Like what is in each spot? Better yet, can you come and create a replica classroom for me here in VA? I have pictures up and I thought I liked my room pretty well…but oh NO ma'am…I now to need to tear down and rebuild. STAT. ok. im done…and yes, I know this sounds stalkerish! Your classroom is beautiful. Thank you so much for sharing, you are giving this first year teacher so much inspiration! 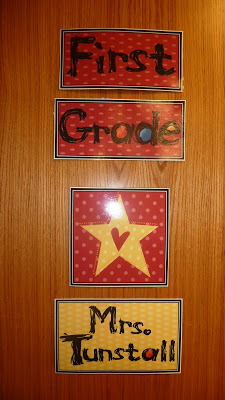 Do you have a printable of your labels for the book barn area of your classroom? i just love it all!! I bet the kids adore it as well! What is the font you use on the word wall? What sort of things are in the word work center? I see the gatorade bottle and I can make out a couple of items in the bottles, but what did they used them for? I need to revamp my word center.